Wow! 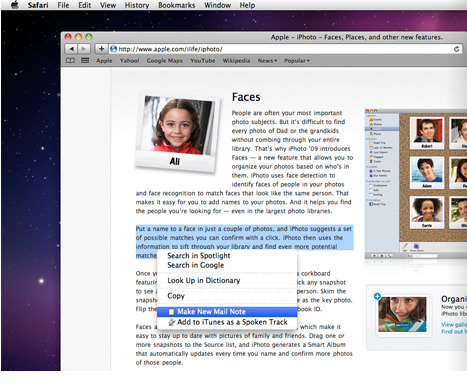 Once again Apple have proven why at least in my opinion they make the best operating system on the planet. This latest version of the software is codenamed Snow Leopard, updating version 10.5 Leopard. It's a funny update this one. It is not exactly one that has had the same gasps from the press as 10.4 Tiger but in some ways the amount of improvements that we can't see in Snow Leopard make it pretty darn significant. The key to this upgrade is that it's subtle. The DVD that comes with Snow Leopard will work as a clean install or as an upgrade version to 10.5. My MacBook proved to be a fun test subject and in all seriousness more likely to be the sort of machine we'd find in your home instead of some sort of high faulting rig. Clean installation took about 15 minutes from start to finish and once again there were no issues involved. Just kick back and let the install do the work. This was carried out on a clean system with a similar spec. The remainder of this review refers to a system that was upgraded from 10.5. Something worthy of note is that although I had no issues with any setup option that I took, Snow Leopard allows you to pick up on an installation if you run out of power or something else occurs whilst you are getting your computer ready for 10.6, it's a feature that really impressed me as often all is lost when you break off during an install. First thing you will notice is that this software is fast. Mac users for years have been used to a quick boot up time but this certainly takes the cake in terms of the sheer speed that Snow Leopard can be up and running in. I was honestly surprised that I noticed this as you would normally think that it was just part of the marketing nonsense that comes with a new OS upgrade. Snow Leopard is legitimately one fast cat. The changes in appearance to everyday usage of your computer will be minimal from 10.5 so don't go expecting them. It's when you start doing things with your computer that you will see that 10.6 is designed to make your experience and interaction with your computer a more streamlined and faster experience if that makes sense. Of course there are small graphical changes, but once again this is to make your use of the computer more efficient. One of the reasons for this is that Snow Leopard supports both 32 and 64 bit software architecture. To move from one mode to the other is a pretty seamless experience and one that most of you out there will not have to do for some time. Once again however I noted that my software all seemed to work faster whether it was first or third party. Another major thing to note is that the install size of Snow Leopard is a LOT smaller than that of 10.5 and some of your applications are up to 100mb smaller than their previous versions such as mail. This is an awesome effort and indicative of the length that Apple are going to, to make this system a pleasure to use without being a system resource hog. I think that I should get this out of the way before going much further into detail. This is not a technical review. For that you will need to go elsewhere. This is a review by an everyday user of Apple Computers and I am commenting on the same stuff that anyone else who uses the software would want to know. I am not going into depth about 64 bit structure and the like. There are other websites that will bore you to tears with technical waffle. Good news for you is that most of your applications will work on the new OS will very little getting in the way for you. Something to note however, if you run some older printers or programs from before the drivers and apps became universal then you will need to go back and reinstall Rosetta. It's not really an issue, just something you need to be aware of. There has been a nice change to the dock that I really like and that is that Expose has been linked to the dock in order to get the most from your workflow. By holding down your mouse on say the Firefox logo, it springs up to show you the open windows that you might have with any given application so rather than cycling through them. You can also drag a file onto an application and then you can choose which window you want the file to be dropped into. Cool stuff. If you like the sound of that, then also the ability to preview files live without opening an application will also prove to be very popular with most users who just want to jump into finder, see the file and then decide if they want to open it in it's dedicated application. 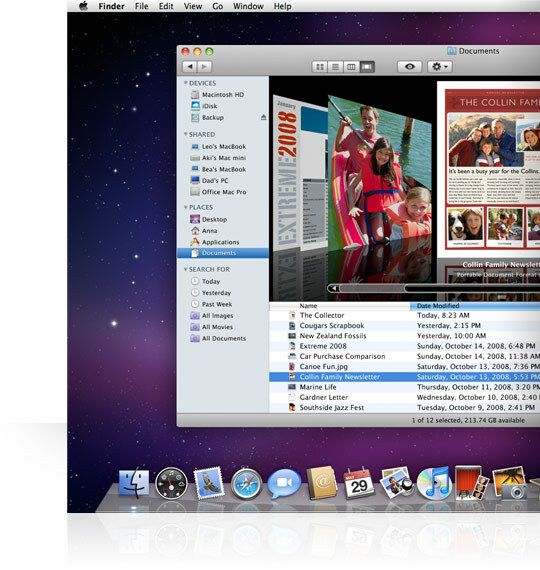 Another of the applications that has got a pretty big facelift is QuickTime, now called Quicktime X. It has been streamlined immensely and the menu and play buttons etc have been worked onto the screen itself so that more of the screen can be used actually watching the movie with menu options only coming up when you actually need them instead of being a detriment to your viewing experience. Quicktime has also had a cool little feature built in where you can record movies from either the screen of your computer or from the webcam from your computer if you have one with the machine or plugged in. Lots of fun. So far up to the time of reviewing the software and having had it installed for a week on my everyday computer before writing this review, I've yet to have anything fail or work in a way that I would blame the operating system for. All of my software from the past that has worked has certainly continued to do so, including your common type apps such as Adobe Creative Suite 2 and Microsoft Office Mac. All these have been working fine the whole time and even open source application have kept up without me having to update or do anything different with them. An example of this being Audacity. Do I think that this software is worth it? Absolutely! If not for all the good things that it can do for your computer but the fact that it's $39.00 might encourage you to give it a shot as well. I would consider it to be one of the easiest updates I have ever had to do on a machine and I applaud Apple on making this OS such a streamlined experience to use. It's actually nice to use and everyday Apple users are going to most certainly benefit from the changes. I hope you enjoy Snow Leopard as much as I do. I am sure that if you want to find faults with the OS there will be sites that do benchmarks and try to break software. All we have done is relate to the human experience, which in my opinion as a Mac user of many years, essentially is what Apple has always tried to integrate itself into; the human experience.